Learn it or Burn it. ptcrew Forum Index -> Clean Up, Aisle 5! 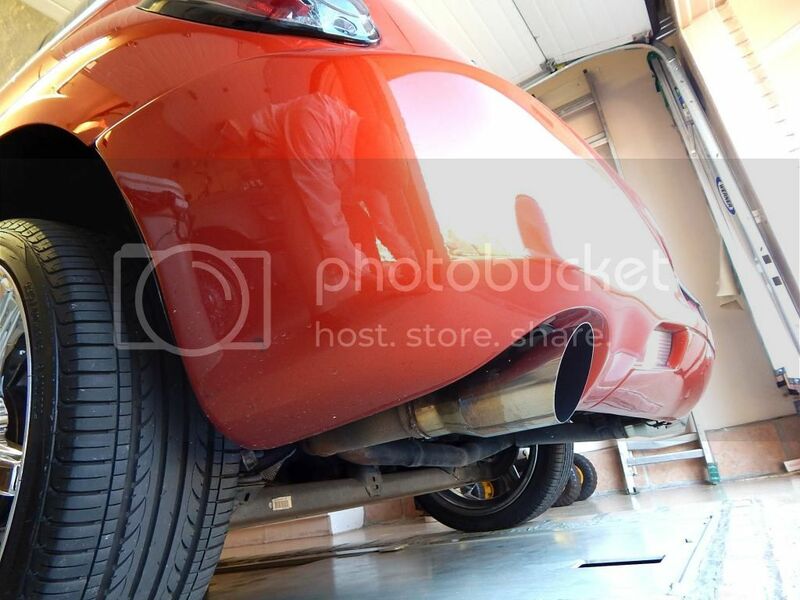 I got "down" low and polished the chrome exhaust tips on the new to me "Limited" yesterday. The right hand side looks great. BUT.....the left hand side is discolored to about half way back. Looks to me like just more exhaust heat there; or, overzealous welding. Is there anything that will remove the discolored area? There is no actual, true "dual exhaust" for the Cruisers, only the splits behind the axle into dual tips. So depending on how the split is made, a T or a Y, determines the balance of flow between the 2 tips. There a lot of info to find with a Google search. Christy, AKA Snittykitty, has never sold an ad on the Crew and never had a cash call to pay the bills or even hinted. This forum lives or dies by donations. She created this forum because of her love of Cruisers and even though us motor heads have jacked it for ourselves and she is more into stylin', she has never thrown in the towel. Why not send her a a message once in a while saying how you appreciate her loyalty? Keep Cruisin' everybody and have a nice day. I found both Blue Job, and Blue-Be-Gone. Looking good, post up more pics when done. 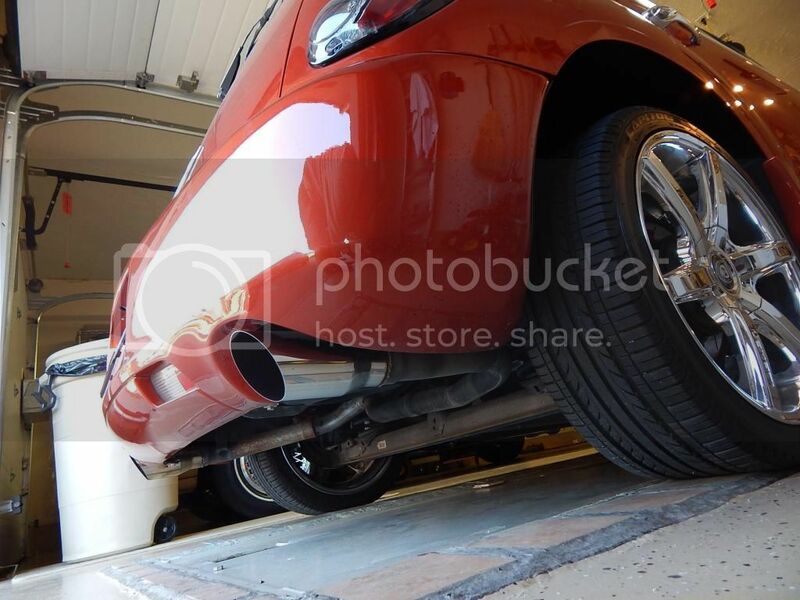 Your picture are a good example of why dual tail pipes do not really work on the PT Cruiser. There is a long time Motor Cycle and Boat product that will get much of the heat discoloration removed. Most chrome polishes for automotive are not as good as BLUE AWAY CHROME POLISH. Any members that have a Flat Bottom or Hydro with Sanderson's or a Harley with a set of chrome pipes will attest to how well this product works. 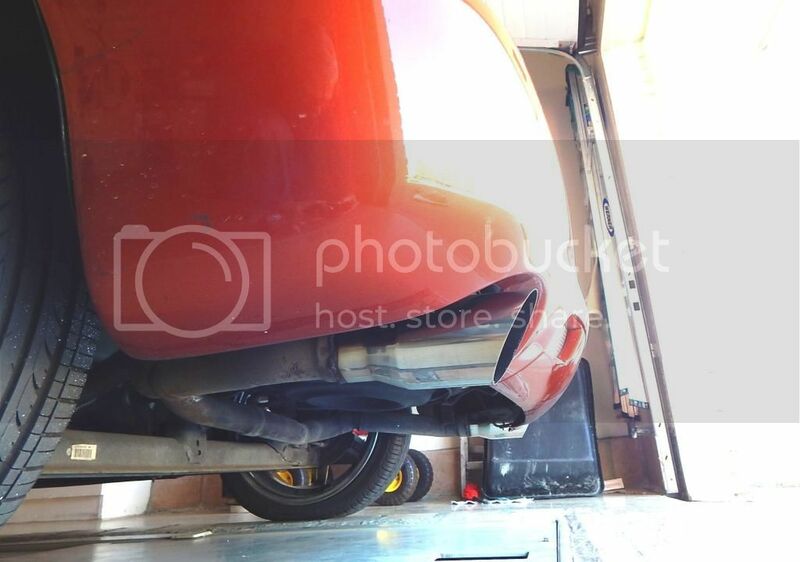 The other option would be to get a set of blue tail pipes for both sides. That way it will look balanced. See "Ricer" junk and accessories. Hot rodders are a strange lot. They’ll spend thousands of dollars on performance parts to improve acceleration, handling or braking, but most won’t spend one dime on testing to discover if all those parts really made a difference! I don't think anyone thinks the dual tips add anything to the car besides a cool look! That is a great looking Cruiser! Good luck in cleaning up the chrome it can be a challenge! During one of my "I need to think about this" periods, I attempted to remove the bluing on the exhaust tip. I bought a product Called "Blue-B-Gone" which comes in a tall bottle in mostly liquid form. Forget hand rubbing! No effect! Forget even hand rubbing with a 3M pad! NO effect! I ended up using my cordless drill, which has a extra mandrel with a flat velcro surface. I cut a piece of light duty 3M pad, and I polished it...and I polished it....and I polished it with heavier pressure each time! I finally did make a pretty good improvement. Except I think that my chrome polish would have worked just as good with as much abrasion as I ended up using. looks pretty good to me!